After a month of steady practice at Hemma, we are inspired yet again by the courage and commitment of this community! The sticker frenzy of our 30 days of practice has come to a close, but we hope your intention for daily practice stays open. Let’s see if we can turn this into 60 days of practice, or 100 days of practice! If you participated in the challenge, take a moment to celebrate your successes and reflect on what you can carry forward into the rest of Spring. The most important thing to remember is to be kind to yourself, and flexible with your expectations when necessary. For myself, I had grand plans for a long meditation practice every day but as we shifted into Spring I heard the call from my body for “more movement!” so I adjusted my practice time to include more asana. And then on days that life got crazy and time was tight, I would practice joint releasing movements, 2 sun salutations, followed by 5 minutes of meditation. Sure I had planned for more and I heard the little voice (you know the one) saying “but that’s not long enough. You can do better…” If I put all my trust in the little voice then I might feel like I failed on those days. What my Yoga practice has taught me over the years is that this is a practice of flexibility – flexibility of the mind. It’s a practice of being able to bend and flow with life’s curve balls and adjust one’s expectations of oneself accordingly. 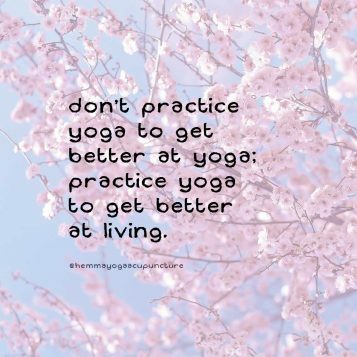 This is truly a lifelong practice and we hope you will join us to continue to explore daily practice, on and off the mat!